Taunton Brewers is one of the city’s must-know suppliers for painters, decorators and DIYers alike. We stock a large array of paints – from trade to designer – and a huge choice of wallpaper patterns. As well as the surprising choice we offer in-store, you can view the entire range of paints and fabrics here using our dedicated online browser. If you’re with the children, there’s no need to rush decision-making as we have a kids’ area set up to keep them happy while you shop. 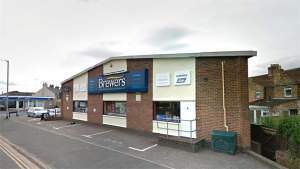 You’ll find the Taunton Decorator Centre on the A3038 Priory Bridge Road. We’re just before Somerset County Cricket Club, right after a Volvo dealership if you’re coming from the M5 motorway; and if you’re coming from the Station Road end of town, we’re on the right-hand side just past the huge Viridor office block. There’s lots of free parking and the store is fully accessible for wheelchair users. From Priory Avenue, take the second exit at the roundabout on to Priory Bridge Road, continue on and the store is on the left corner, joining Winchester Street. From Deller's Wharf, turn right on to Priory Bridge Road. Continue on over the River Tone and the store is on the right corner joining Winchester Street. From Station Road, turn on to Priory Bridge Road. Continue on over the River Tone and the store is on the right corner joining Winchester Street.